Down at the beach and the surrounding wooded habitat, several birds can be seen. For those who split everything that moves (like me) these Pale-bellied Brent Geese are of interest. Whether or not you split them, they are a natty little goose. This Black-crowned Night-Heron had a last feed before heading off to roost. Back at the H. Smith Richardson reserve the warm sun meant birding was more pleasant, it also meant some of the birds had moved on, we did finally get a record shot of an incedibly elusive Common Yellowthroat and a passing Northern Parula was not much more confiding. Butterflies basked in the sun including these two species; American Painted Lady and the Question Mark, so named for the small but discernably white crescent and dot on the under wing. A male Orchard Oriole was in good voice and close by a female Black-and-white Warbler put in a brief appearance. A Downy Woodpecker performed well for the camera feeding away with no concern for our presence, the tiny black spots on the outer tail feathers can just be made out in this picture. Overhead a Red-tailed Hawk circled. Elis was really enjoying her time in these verdent forests seeing many new birds and experiencing the New England spring in all its glory. I, on the other hand, seem to be slightly less enthralled! I just closed my eyes for an instant (honest) enjoying the warm sun on my back, lovely! Hi Rick and Elis, Hope you are both having a great time out in the US. 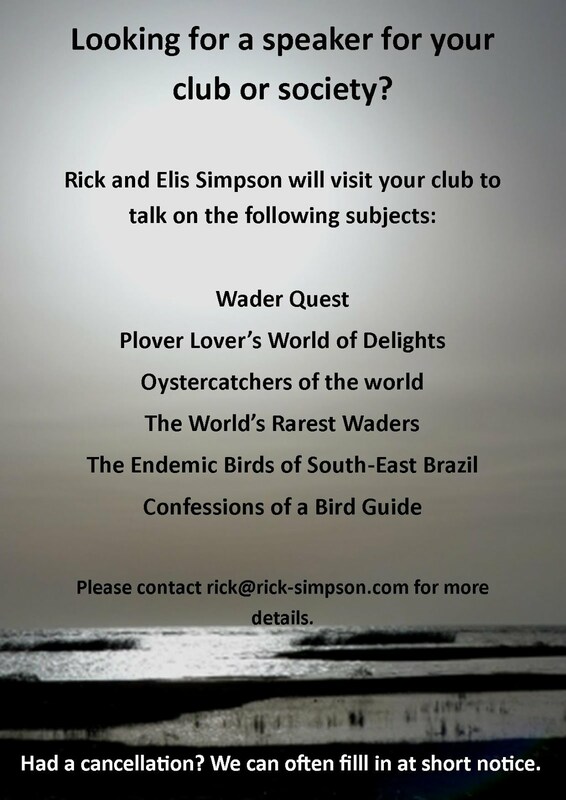 Rick, in the last pic you look how I felt after missing the Stygian Owl at REGUA last year! Hi Lee, good to hear from you. We are having such a good time that I haven't had time to update the blog, and where am I to display all the 3000+ photos Elis has taken? I'll get to it when I get back and have more time, can't see me having too much to rush about for in Bucks! Bad luck with the Stygian though.